By the 13th century this collection of miscellaneous texts, which includes tracts on liturgical symbolism and on the calendar, and various theological notes, belonged to the Benedictine abbey of the Virgin and St. Botulf at Thorney, a few miles north-east of Peterborough. 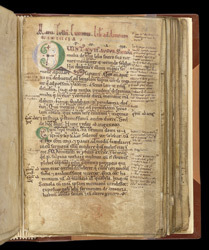 This is shown by an ownership inscription at the beginning, and a fragment of the mortuary roll of Ralph, Abbot of Thorney (d. 1216), which used to be at the end. The start of Cicero's 'On Friendship' has a three-colour initial 'Q' whose elegant tail was anticipated by the scribe, who left a gap in his text for it. The text is fairly heavily annotated in the margins, and between the lines, indicating an active interest in such classical works by monastic readers.